Another intriguing photo from Pat of Plant yr Yd Coven - this time a strange purple shaft of light at The Devil's Ring and Finger, near Market Drayton, in Shropshire. The suggestively named Neolithic monument is thought to have once been part of a burial chamber. Pat said the holed stone and tall rock - in secluded countryside and often hidden from view by the surrounding vegetation - is an "amazing place". 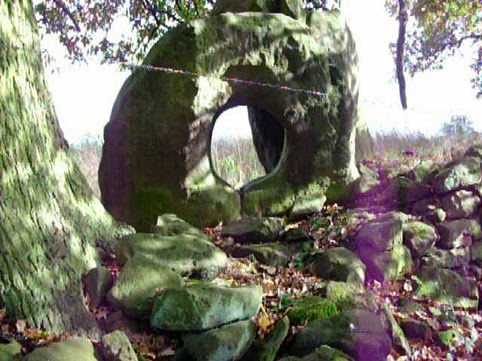 About the photo, he said: "We have been fortunate enough to capture the violet `earth energies` around the time leading to Samhain and past the date." "It is rare to be able to capture these," he added. The photo is copyright Pat and Plant yr Yd Coven. Cool, just sent those links to blogger friends in east and west UK, not sure if they follow u there. that second site The Modern Antiquarian looks of interest to surf through, so thanks.